I read them primarily and initially out of research (since I have been writing my mental health book) and also out of curiosity. Having finished them, however, something greater stuck with me. Let’s first take a look at Carraway’s book. First of all, it is massively popular with twenty-something Mormon ladies. Even the girl at Deseret Book when we bought it told us how much she loved this book and how it helped get her back into church and such. So, Carraway definitely has her target market spot on and is really hitting all the bases with them, from her speaking engagements to journals and quotation cards (or whatever they are) that they sell at Deseret Book. This (more than the) Tattooed Mormon thing is really hitting a chord, and I have to give Carraway credit for that. It’s so important to have someone young (and who is a convert and thus lived “outside” the Mormon world for most of her life thus far) communicate their story. It brings a fresh outlook to faith and the Gospel in general. To me, the most powerful parts of the book were where she details being in Utah and being ostracized and looked down on because of her tattoos, these visual reminders of her past life. People assumed that she wasn’t “Mormon” enough or “righteous” because of those tattoos. Utah, right? What’s wrong with you, Utah? But once she gained publicity and was on the cover of LDS Living, suddenly people wanted to take photos with her. Seriously, what is up, Mormon culture? Questions of Mormon culture aside, Carraway’s massive success is inspiring. I only wished her writing lived up to it. I mean, not that I’m Jane Austen or anything, but I do have some writing experience and experience with teaching about writing…so. It was somewhat painful to read at points, mostly due to a lack of quotation/scripture integration and other simple things that could have been smoothed over with maybe one or two good read-throughs or revisions. And speaking of writing, let’s look at Hoiland’s book. Can I call her Ashmae? Yes? Thank you, I will. Ashmae’s book is beautiful. I mean, the woman has a MA in Poetry, so should we expect anything less? It is written beautifully, laid out beautifully, and even fits in your hands beautifully. It’s a work of art, and it reads like one. I mean, I read it in less than twenty four hours. The goal of Ashmae’s book is much different than Al Carraway’s book. Ashmae takes us on a dreamlike journey through her life and experiences. She carries us into and out of stories, times, and places, showing us that life isn’t always perfect or ideal and that we aren’t always perfect or ideal, but that’s the way it’s meant to be. Ashmae wants the reader to know that questions aren’t spiritual deal breakers and there is always progress to be made. One poignant realization Ashmae shared that resonated with me was how she felt that, on her mission, she had a direct connection to God and received answers clearly. A few years out, she sees more “godliness” in life and its various beauties and eccentricities but experiences less direct communication. She ponders if maybe that shift shows God’s trust in her, in us. So, while Carraway likes to speak in absolutes (“With God, life is oh so good.” “You will feel (the Spirit), and it will strengthen you. Every time. Always.” “Choose God, because once you choose God, anything is possible.”), Ashmae’s book floats and soars in ideas, including that maybe those absolutes are up to interpretation. Things might not always be so cut and dry. Not everyone is going to feel and experience the same thing, the same Relief Society lesson, or the same scripture in the same way. It’s like my husband commented—the two women seem to be at different points on the journey, and that’s okay. 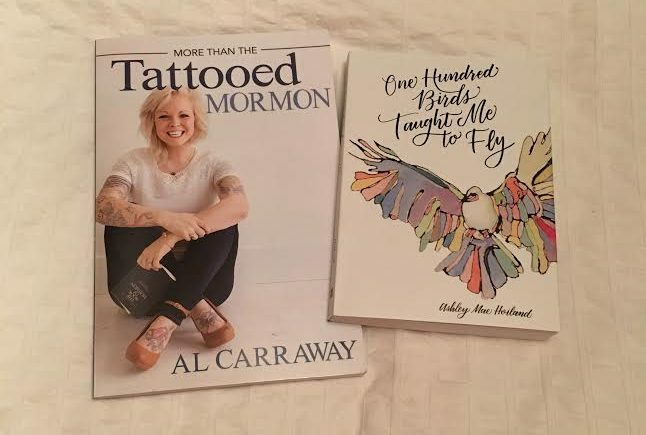 As I finished “One Hundred Birds Taught Me to Fly” and compared it to “More than the Tattooed Mormon,” I had the thought that we need both types of women and both types of dialogue in the Church. We are not all Al Carraway’s hope and optimism and rah-rah! But neither are we all the pensive, curious, bravely questioning Ashmae Hoiland. Most of us are probably somewhere in the middle. I’m grateful for these voices. I’m glad that they didn’t feel ashamed at being heard or afraid to tell their stories. We need them. We need women who aren’t afraid to shout praises or whisper questions, women who are brave enough to be who they are, even if it is not what tradition or Church culture expects them to be. Without women like that, positive progress halts and stalls. But with women like that, the future is bright. Who is your favorite religious author?